I have been playing with Microsoft Advanced Threat Analytics (ATA) for past few months. I found it useful for Blue Teams and scary as a Red Teamer as it detects many Active Directory (AD) tools and techniques. Naturally, I needed ways to bypass it and that is something which motivated me to spend weekends and nights looking for ways out. I found some methods to bypass ATA, some to avoid it and some to attack the ATA installation. I gave a talk about Evading Microsoft ATA for Active Directory Dominance at Black Hat USA last week (slides at the end of the post) and would speak at 44CON and BruCON on some of the additional research I am doing. What I found mostly during my research was it is not really difficult to evade detection by ATA as long as we are not running tools blindly without understanding what they do. So, to generate interest on using offensive tools more wisely and modifying techniques based on the detection mechanisms, in addition to my talks at multiple conferences, I announce a Week of Evading Microsoft ATA beginning from 7th of August 2017. 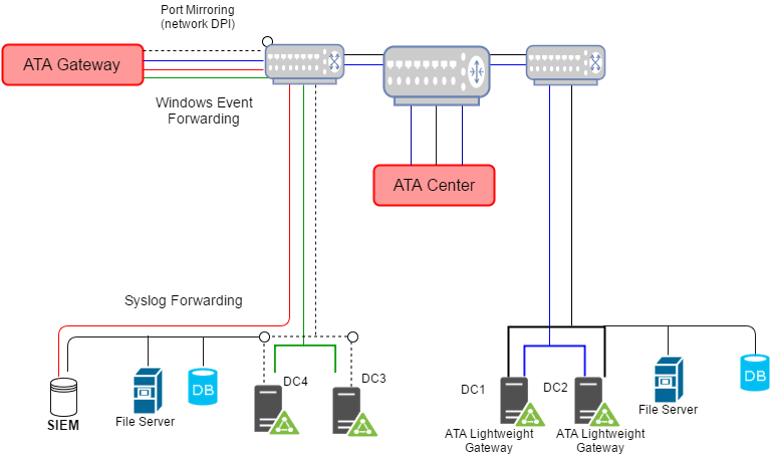 ATA is a platform which listens to certain protocols going to the Domain Controllers (DC) of a domain. It can integrate with syslog, SIEM etc. It can detect attacks based on anomaly and user behaviour. AFAIK, for anomaly detection there is no learning period for some attacks (one week for certain attacks) and for behavioural detection there is a learning period of 21 days. We are going to focus only on the anomaly based attacks. ATA Gateway is that part which reads the traffic and parses it. ATA Center is that part which stores the parsed traffic, do analysis, stores everything in a mongodb and hosts ATA console where we can see alerts. The Gateway can either be a separate box or a lightweight one which can be installed on to a DC. More on architecture here. 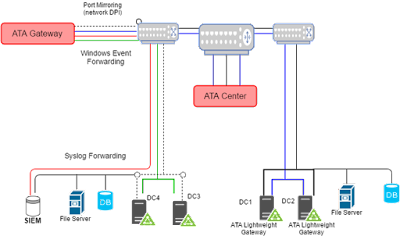 The lab setup uses a Lightweight ATA Gateway with ATA 1.8 (started with 1.7) which is the latest at the time of writing - 30th July 2017. I use this installation in my PowerShell and Active Directory training and therefore, the installation has been tested by more than 400 hackers and infosec professionals in last 7 months. What attacks can ATA detect? Many! Have a look at this link: What threats does ATA look for? Above attacks result in enumeration of users, computers, group membership, sessions etc. Once we understand the architecture, let's jump in and have a look at various attacks. We will follow a simple "attack chain" where we begin with a normal domain user privileges and then work our way up to domain dominance. We will see ATA detects us and how it can be bypassed at each step. Why so? Because ATA currently detects such enumeration done using SAMR protocol which is used by net.exe. PowerView uses LDAP queries which ATA does not care about currently for enumeration. In fact, ATA is mostly interested in the authentication related data when it comes to LDAP. Get all users in the domain "opsdc"
PS C:\Users\labuser\Desktop>  Get-WmiObject -Class win32_group -Filter "Domain='opsdc'"
Because we have enough information now, let's move ahead with some more enumeration. Let's start hunting for local admin privileges on other boxes. Now, if we look at the alert closely. ATA complains about Recon against only the DC. What does that mean? That means, if we gather the information from the DC but do not run user hunting against the DC it would be possible to bypass this detection. To avoid running user hunting against the DC, we need to use the -ComputerFile parameter of Invoke-UserHunter or Find-LocalAdminAccess and provide a list of computers which does not contain the name or IP of the DC. And above will not be detected by ATA! A simple but effective bypass ;) As long as we keep our communication with the DC minimum, chances of detection would be low. Another enumeration technique, not caught by ATA right now, is using SPN scanning. Read this article to know more about SPNs. We will touch SPN scanning on Day 4. And this doesn't get detected! I have another brute-force bypass under research and I will present that during my talk at BruCON. I found this info very useful. I think you might also want to know how to tell if your phone is tapped. If interested, navigate over here.